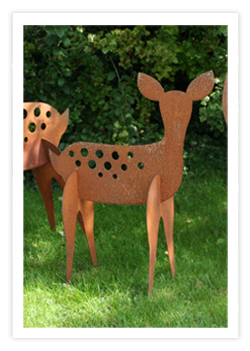 Here is the Fawn of our family of deers, made from high quality steel and coated in a rust effect. The Fawn would look great on it own or with its family. This would make a great border sculpture or lawn art. Unlike other steel deers, The Fawn comes flat pack and easlier slots together without screws or bolts.